At the end of the day retire to your master suite with tray ceiling and attached bathroom suite. There is even room for sitting area in the master! -The back yard so beautiful and semi private - with patio and awning - a must see! Additional Features and Amenities This gorgeous home does not disappoint! 3 bedroom, 3 bathroom home in Celebrate with approximately 2,864 square feet. 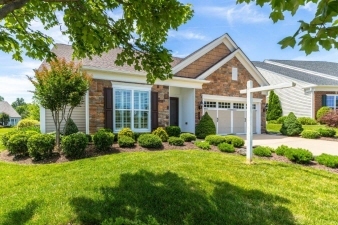 This Wilson model with a loft is just what you are looking for. Enter the front door and you can see straight through to the patio and trees, what a calming, soothing home, and view! The immaculate interior has been lovingly cared for from top to bottom. Enjoy open floor plan living in your new great room, accented by shiny hardwood floors, vaulted ceilings, and a grand fireplace. The kitchen features a breakfast bar, wooden 42 inch cabinets, stainless steel appliances, accent and recessed lighting, and is adjacent to the breakfast room which lets in so much natural sunlight. Don't miss the view to your private backyard escape. Host your favorite people over for a formal or informal occasion in the separate dining room. What a stunner; more hardwood, crown molding, wainscoting, and a brass chandelier.